I love weaving wider pieces for many reasons, one of which is the chance to get out the big sticks. I use multiple swords, especially when I am doing Andean Pebble Weave with its two sets of string heddles. I often have to open a shed and walk it down to the weaving line in baby steps, using a sword to clear the first heddle while inserting another to clear the next and then inserting another. The swords smack against each other from time to time with a pleasant ‘tok tok’ sound. I love placing them on their pile on the ground when I am done with each part of the process and hearing them rattling and clacking together. I have gathered together quite a few swords over the years. I have no concept of what makes the one perfect sword and have never sought swords with certain characteristics when I have picked them up in my travels. I take one when I can get one if it looks like it might serve a purpose or if it holds memories of time spent with a weaver. I guess I prefer not to have the swords highly polished….the grippier the better. Different weights and shapes serve different purposes for me. 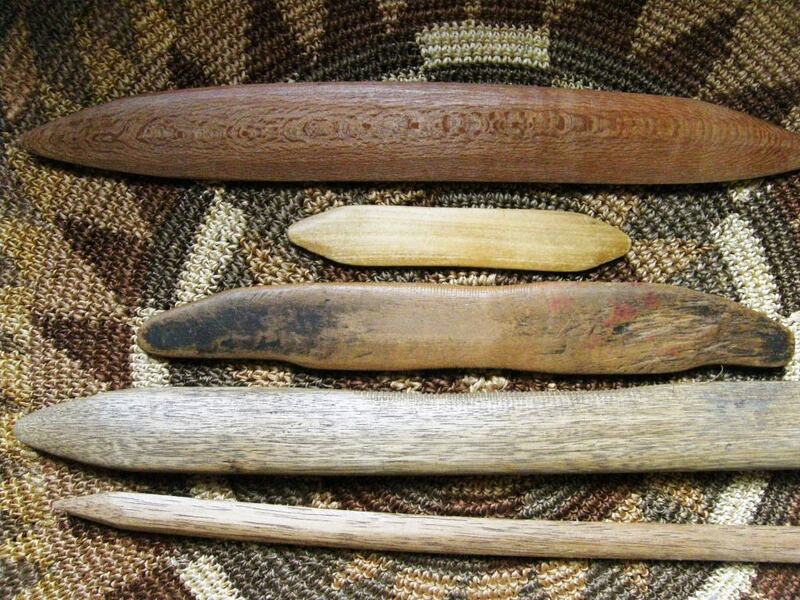 These are the four that I used on my latest project. I bought the lower one at Maryland Sheep and Wool Festival a couple of years ago for no particular reason. It reminds me of the fun two days I spent there with Claudia and Janet. I guess I liked its length and width. It is just the right width for the length that I make my string heddles. 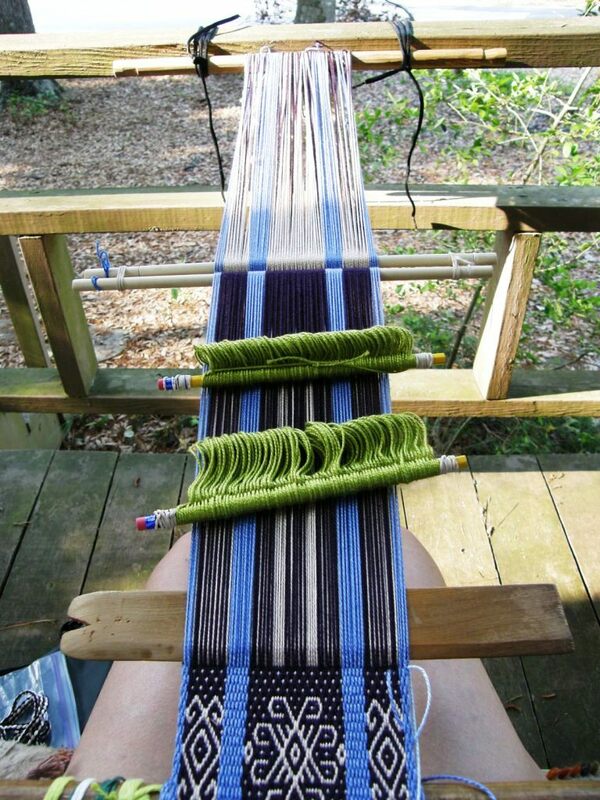 When I am using multiple string heddles, as in the example at left of a warp set up for Andean Pebble Weave, I use the sword to help me raise them. You need to work one set of heddles against the other. I wrap one set of heddles around the sword and roll it. 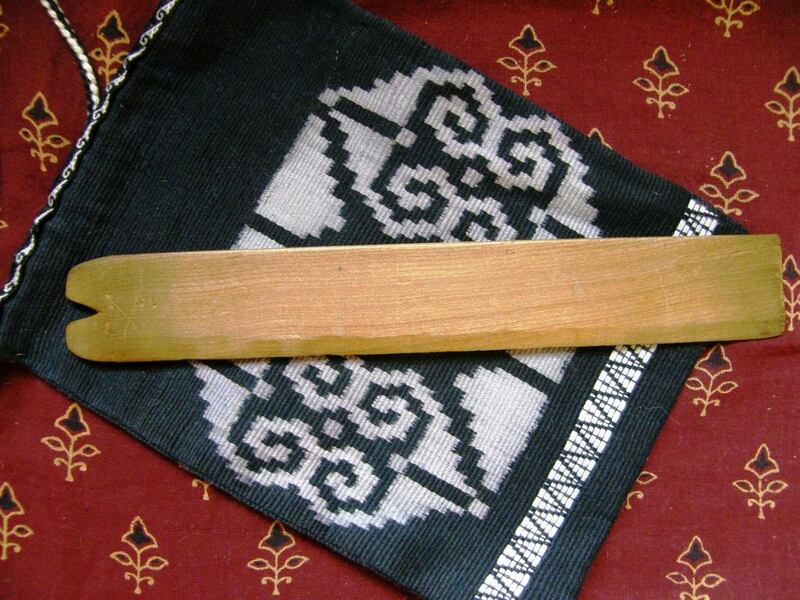 This increases tension on the threads that are held in those heddles. Then I lean forward and relax tension on the warp which slackens the threads in the other heddle. Then I pull up the other set of heddles. Works like a charm. It helps if your sword is just the right width to suit your heddle length. That is probably a lot to ask you visualize so you can watch a weaver from San Ignacio de Loyola, Peru doing it in this short video clip….. 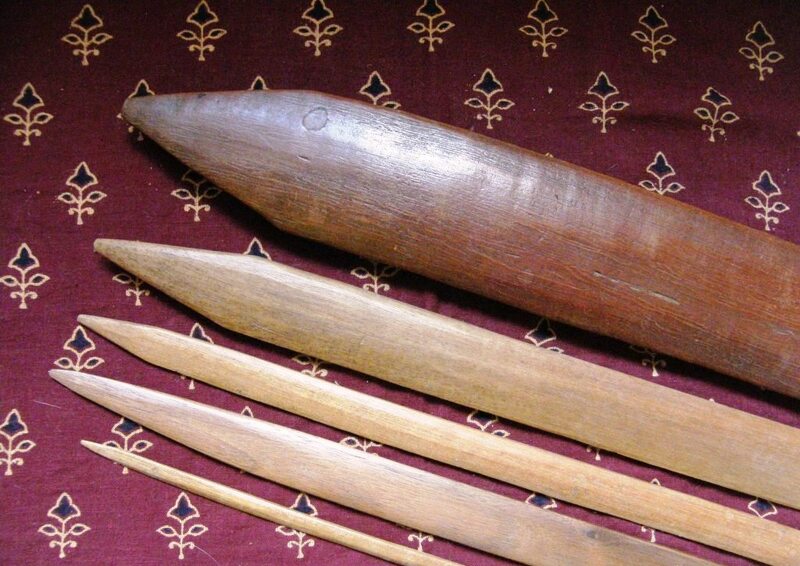 Returning to the picture of the swords, the next one up is what I suspect was meant to be lease stick and was made by a weaving friend’s husband. I like that it is very narrow. Apart from that, it reminds me of Barbara when I use it. I use it when I need to do some warp manipulations right down at the weaving line and there is little space between it and the first set of heddles. The sword is narrow enough to create the space I need in order to get my hands in without taking up too much room. I know that the next two swords up are from Guatemala. I bought the narrower one when I was there in 2008 at the fabulous market stall pictured at left. As for the larger, very well used one….I don’t remember from where or from whom that one came but it looks like a Guatemalan one to me and it’s a beauty! The narrower one has a nice pointed nose which is handy when the space held open by the shed rod has become very narrow and I need to insert a sword with a fine pointy nose to work it back open again. The large sword is the big beast that I need to use to clear the threads in the second set of heddles through the first set. I lean back, strum and then let the big guy, turned on its side, do its thing. So here is what those swords have been helping me create…. I made a two-color panel to go with ikat pre-columbian bird that I showed you last week. The all-black panel comprises the bird motif made with ikat and then filled with pick-up patterning. The new piece is all Andean Pebble Weave. 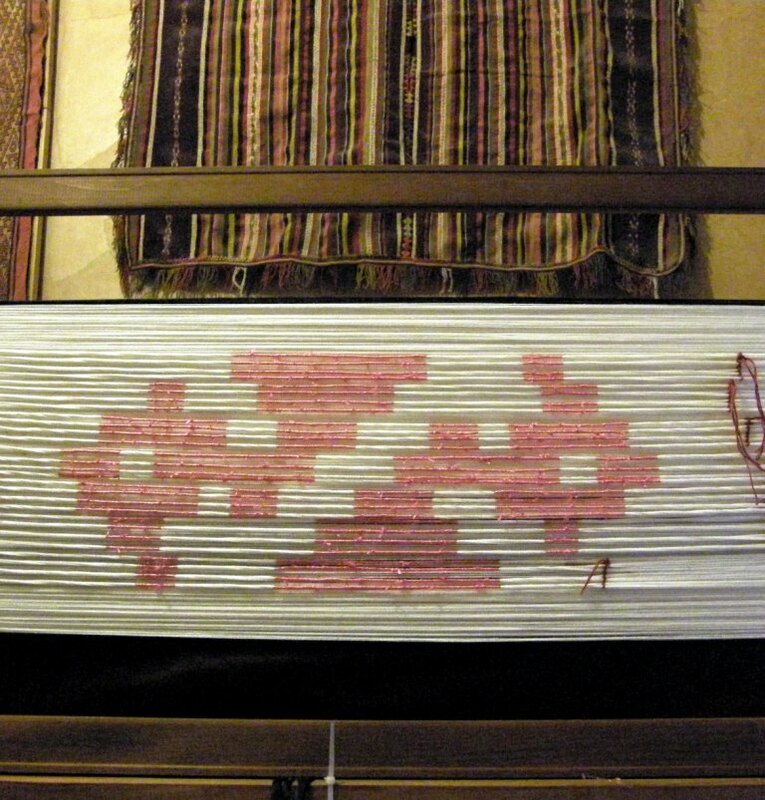 The birds are larger on this one because the dimensions were determined by the structure of the weave rather than by the size of the motif that was fixed by the ikat. 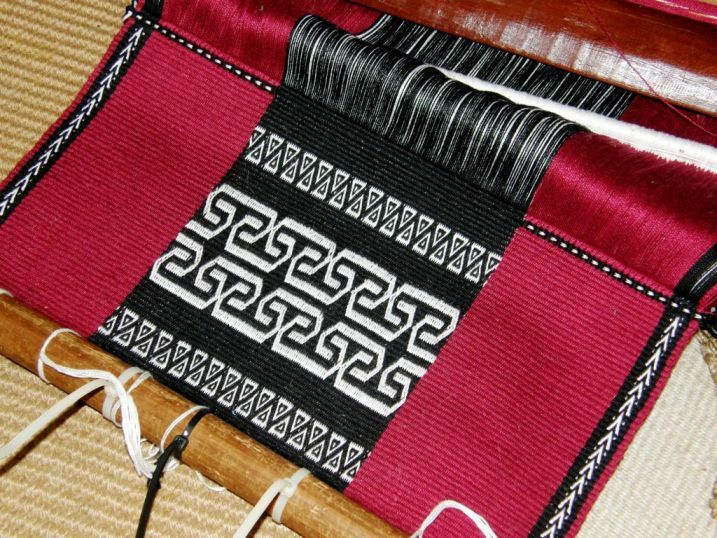 The stepped diagonal line is edged with stitching to sort of carry over the theme of the stitched edges on the ikat piece. The third one in this set will be all white with the ikat motif in black filled in with pick-up patterning. The challenge will be to make this second ikat bird motif as close as possible in size to the first. It’s time to set up the ikat frame again and get used to walking about with bits of ikat tape stuck to my legs and turning up everywhere. 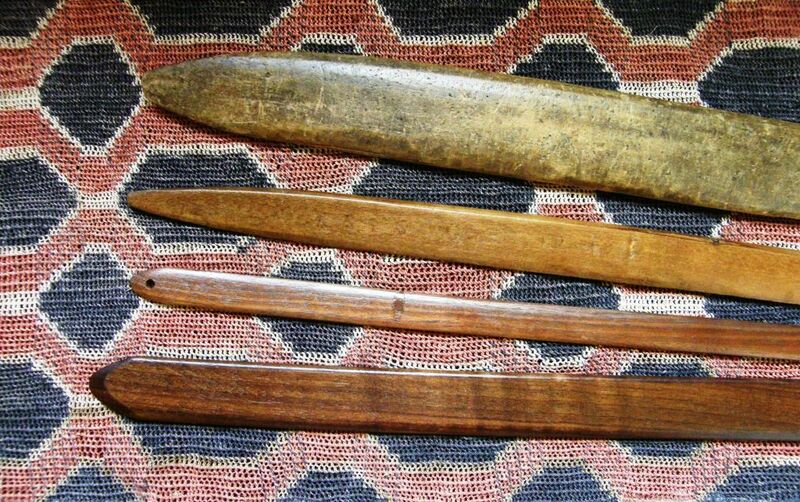 Here are some more swords… These are all Guatemalan and all came from a lady in California who had traveled in Guatemala in the 1970s. She wanted to find a good home for the loom that she had been given by her weaving teachers at that time and she sent me all her equipment while I was in the US as well as her journals that tell the tale of that visit back in the 70s….treasures! The loom bars that I have been using on my current bird project were also hers…good, sturdy, nicely shaped pieces of wood. That very fine sword is a beauty to use when closing the gap on a four-selvedge weaving and that very hefty one was excellent when I did the wide intermesh piece at left. Intermesh is quite dense and I needed the heft of that sword to clear the sheds. These two are from a set of six of various sizes from Salasaca, Ecuador which form part of every weaver’s set of equipment. The large one is from one of the ladies to whom I taught pebble weave and the small one, which is the smallest in the set, is from the gentleman (Anita’s cousin) who taught me the supplementary-warp technique that weavers there use to decorate belts. We used the smaller one for doing pick-up and one of the large ones to beat…it was a violent slamming beating motion on the steeply angled warp. You held it by the handle in your right hand and, as the beater was so much wider than the band, you had to make sure your left hand was well out of the way. 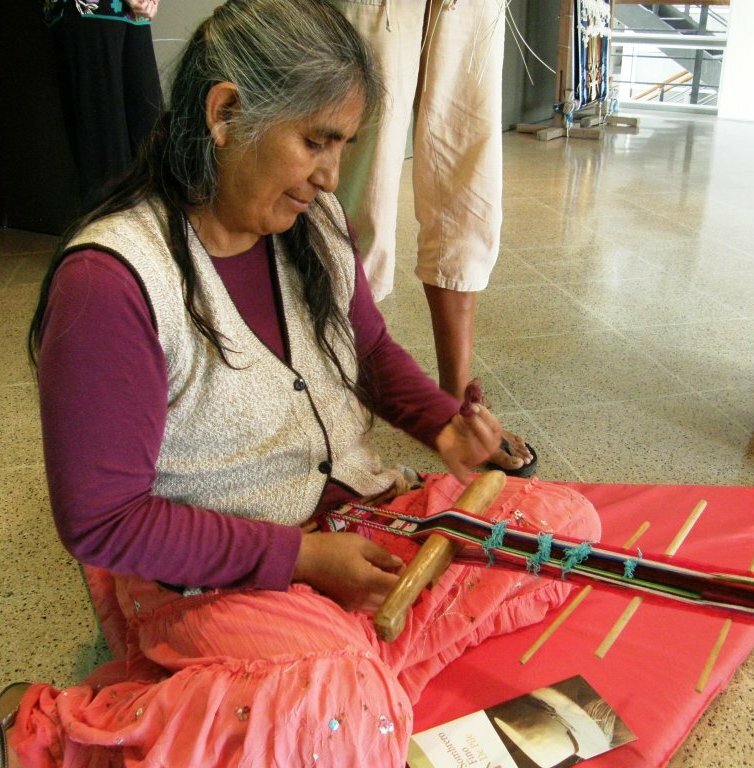 Here’s one that I don’t own and I want to show it to you so that you can see just how different some swords can be… It was being used by an Ayamara backstrap weaver of northern Chile who came to Santa Cruz for a weaving event…. There’s quite a difference between this and the slim tiny sword that I used with my first-ever teacher in Peru… That’s the tiny one there in this picture…the first sword I ever got. I have been using it since 1996 and it has lost its original straight edge. I can’t seem to let it go, though! In this picture you can see swords from various sources. The upper one is a brand new one from the market in Guatemala. It has very sharp edge…too sharp for my liking and I haven’t used it much. Below the tiny one is a very odd one that I got in Peru. It was lying about in a cooperative store and I asked if I could buy it. I am sure that it could tell some stories! It is so very misshapen and has obviously had a lot of use. There are indentations in the wood from years of having warp threads pass over it. There is a little red staining which might be from the cochineal dyepot. The next sword down is from a weaver I visited in San Roque, Ecuador. This sword has also seen a lot of action. 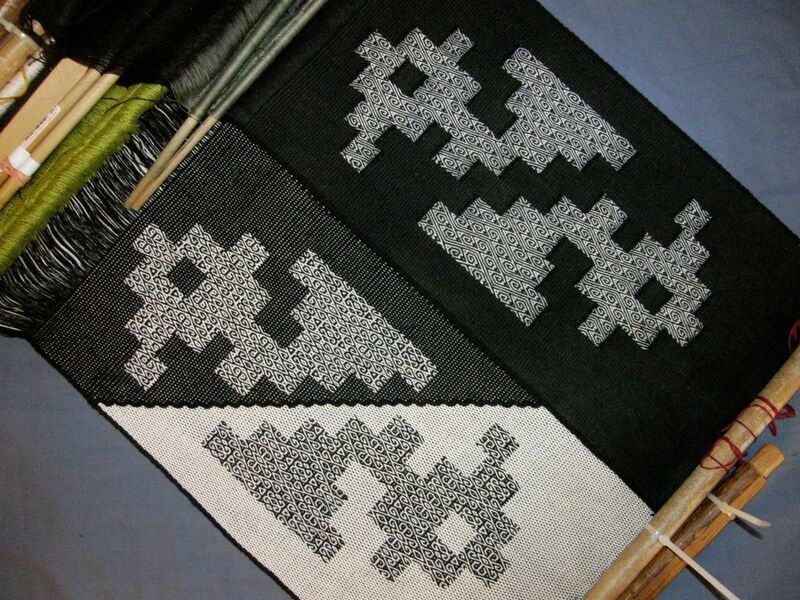 It has lost its straight edge and has developed some very deep indentations from warp threads. The lower one is from the ticlla class that I took at the Encuentro de Tejedores in Cusco. I will leave you with another old faithful of mine…a very humble and ordinary piece of wood. This was made for me by the furniture maker who lived two doors down when I lived in southern Chile. It was originally a very long shuttle for my Navajo loom. When I returned from my first trip to Peru I had it cut down and beveled an edge to make a sword. The rest of the shuttle was made into a portable warping board that I used to take on my travels so that I could warp and weave key fobs along the way. I love this sword. There is nothing pretty about it but it is just the right width for that rolling action I was describing to you when I do two-heddle structures like Andean Pebble Weave and intermesh. I love going to my big bins of sticks and selecting my tools for a new project. 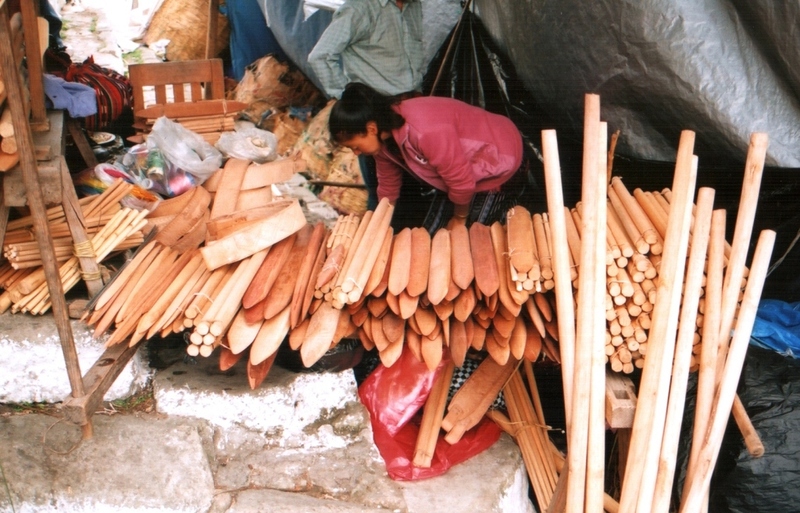 I usually end up sitting on the floor with a pile of sticks around me…picking up each one and examining it. I usually discover one, long forgotten, that had been lost in the depths of the bin….sometimes it is one that would have been ‘just perfect’ for the project I had just completed. But for now, I don’t need sticks. I probably have a week of this kind of ikat wrapping ahead after I wind my new warp. This one will be quite different as the area that I wrapped last time in the picture at left will be the only exposed part this time. GRACIAS por compartir tus conocimientos y muy Feliz 2015 ! ! ! I really enjoyed your post about weaving swords, especially since I like making them and it’s interesting to see the different types. Your birds are extraordinary!